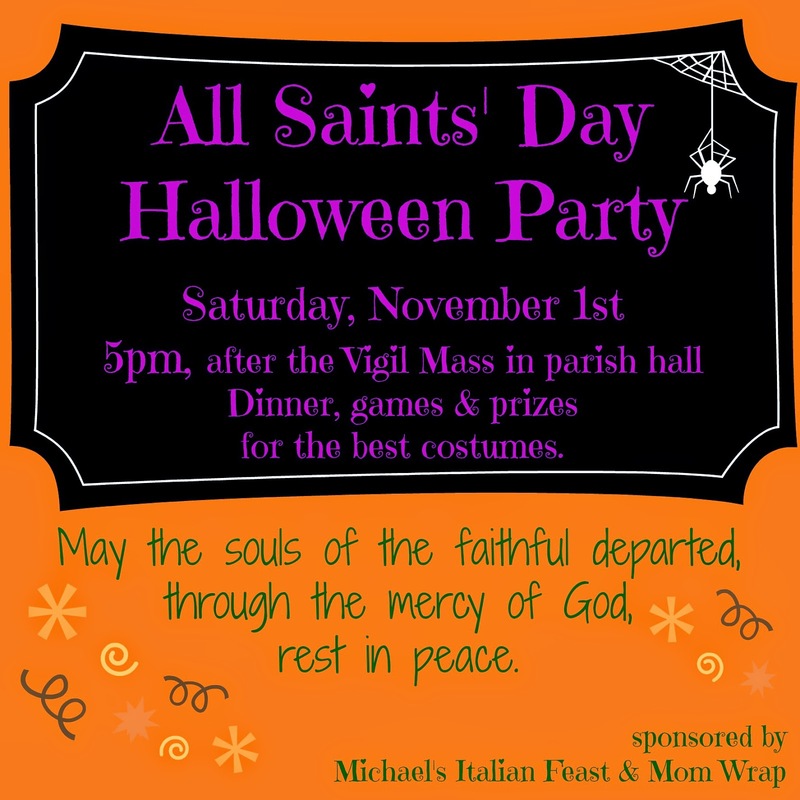 This was the second year I was able to help plan and host the All Saints' Day party at my former parish. 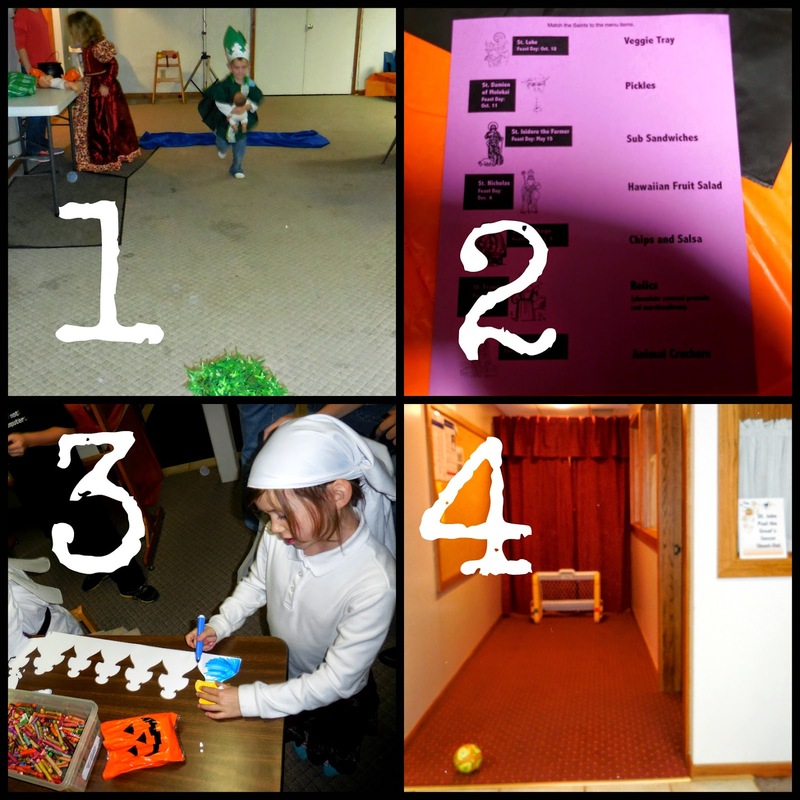 This year we had a slightly different menu, all new games, and some slightly different decorations. All the kids in the CCD classes were personally invited and given little flier invites to take home to their parents. The morning of the party we decorated. I grabbed some Mason jars, candles, and religious art from our house, another mom brought in so many pumpkins from her garden, and we dug into the stash from last year's party. The Mary and Eve print is from Our Lady of the Mississippi sisters. The skull has been used in a pirate party, Halloween decorations, and now the All Saints' Day party. It was definitely worth the $2 I paid for it. This year, along with pumpkins for centerpieces, we also used some pretty fall flowers in Mason jars. It was a great touch. 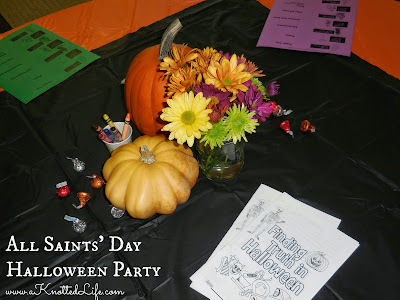 The tables also had Hershey Kisses, Menus, and Finding Truth in Halloween booklets. 1 - David and Goliath - throw duct tape stones at Goliath's head = favorite game of the night. I found the inspiration at Shower of Roses. 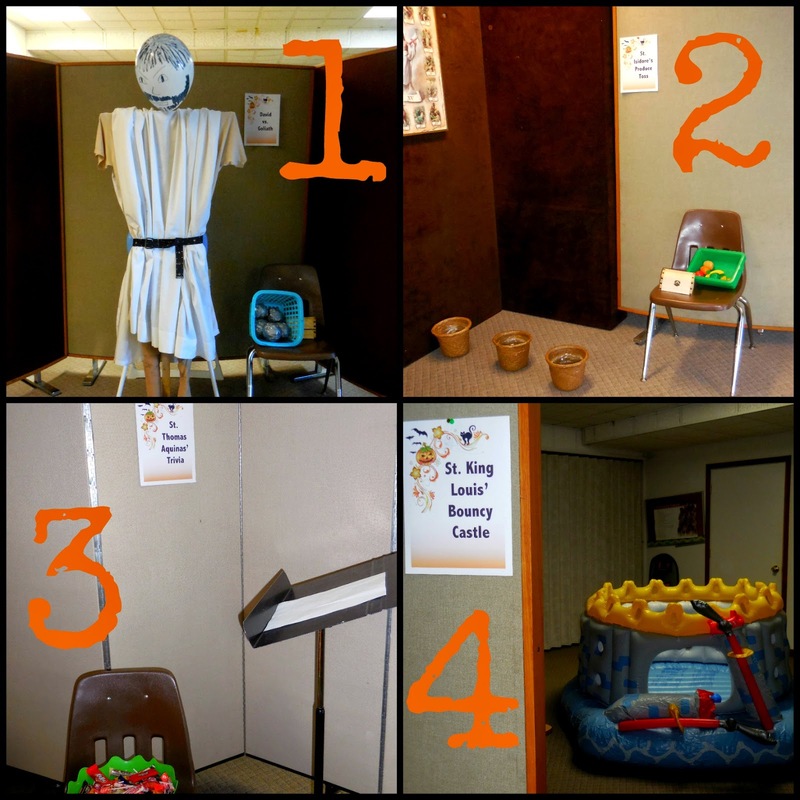 3 - St. Thomas Aquinas' Trivia Game - I used the questions from Catholic Culture. 4 - St. Louis' Bouncy Castle - this was owned by one of the women from the moms' group and was a huge hit for the little kids. 1 - St. Christopher's Foot Race - the kids jumped over the "river" and then had to run around the potted plant and back to the river, all while carrying a baby doll. Ben was St. Michael, L was St. Bernadette, JF was Venerable Fulton Sheen, and JP was wearing his Batman jammies. 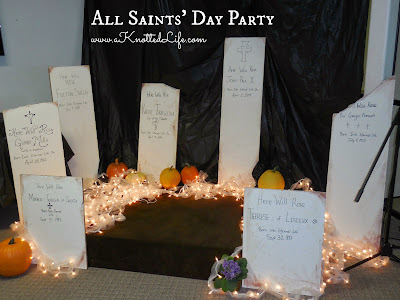 This year we once again recreated a cemetery on the stage area. All the kids (and some of the parents!) came up, one at a time, and shared what saint they were dressed as, and the older kids included a short bio. As each "saint" left the stage we'd all say, "St. So and So, Pray for us!" The kids were adorable and some of the costumes were really clever! 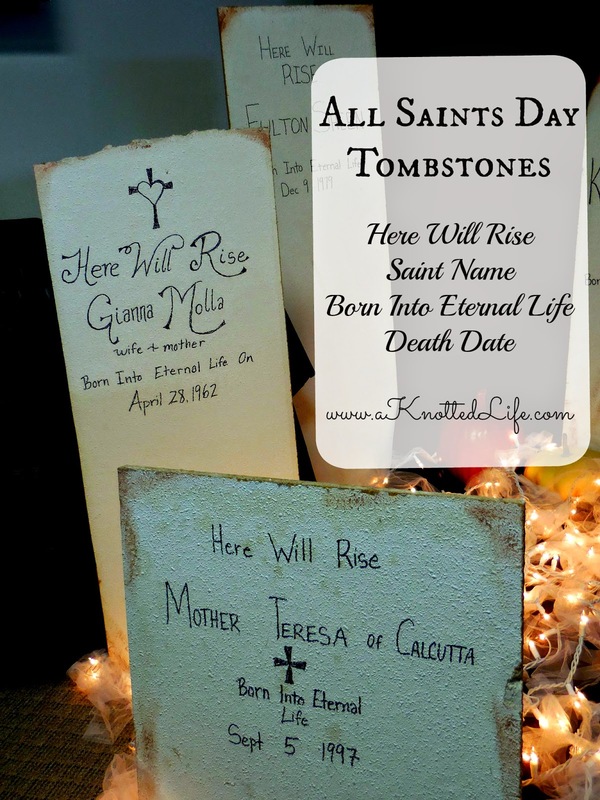 This year I was able to make some new tombstones out of ceiling tiles we ripped out of our basement. I wanted them to redeem the creepy tombstones that are so prominent at Halloween and to remind us of what we believe as Catholics. Inspired by some great suggestions from my readers, the tombstones ended up with some really beautiful wording. So thanks, you guys! Lastly, the parish hall has a large tv that hangs on the wall. Last year we covered it up but this year we used it. 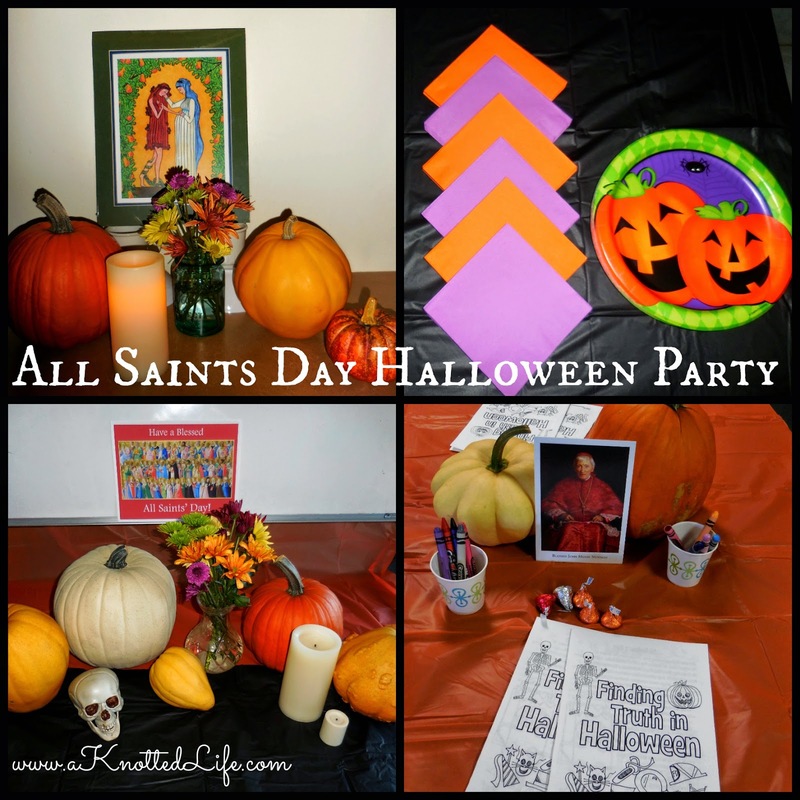 I made a pretty simple slideshow with different saints that scrolled through the whole evening. Next year I'll add more slides to it since I ran out of time to add all the saints I would have liked. I uploaded it to YouTube so please feel free to use it if you'd like! Catholic Stuff You Should Know podcast "Where Is Your Sting? : Forever Young... blessing or burden?" Also from Fr. John and now Father Nathan, Catholic Stuff You Should Know podcast "The Apostolic Pardon: The Ultimate Gift!" You can see what last year's party was like here: All Saints' Halloween Party Recap. Bonnie, I love these ideas. 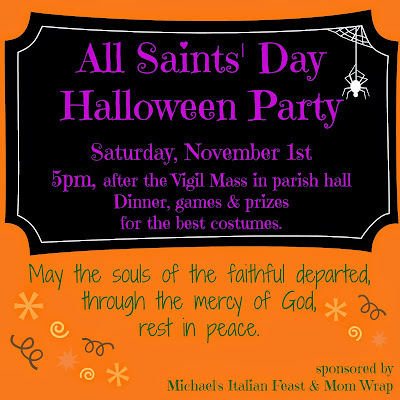 I was feeling kind of bummed that there isn't an All Saints Day costume party around here (that I know of). 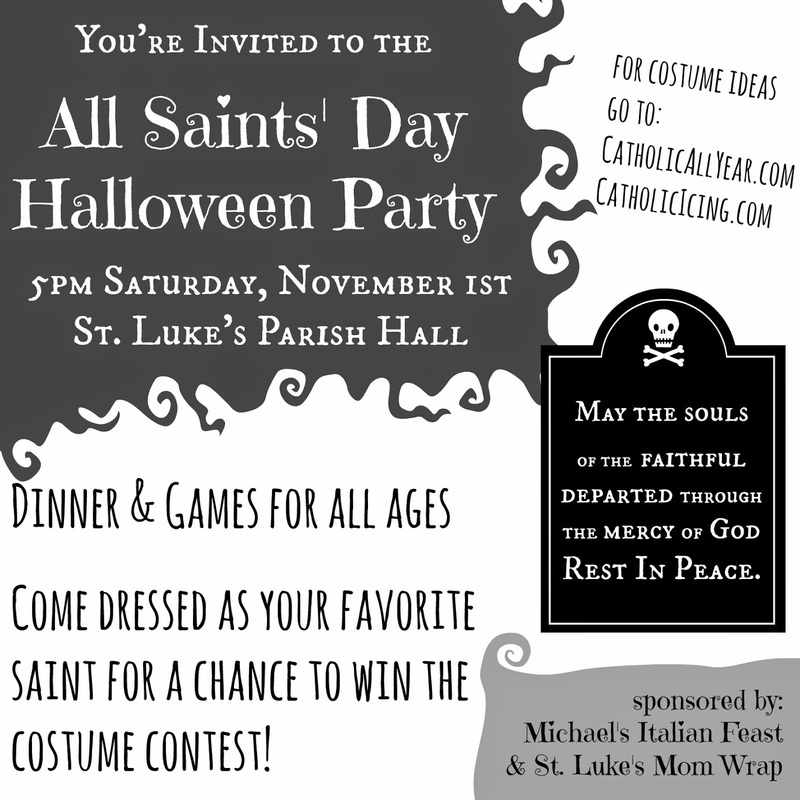 Maybe next year I can get the moms of my parish to work with me on putting together a party ourselves! This is so great! I love all the ideas. Wish we had something like this at our parish! Ditto- I wish our parish did this. So creative, Bonnie! 1. I love the bright purple, orange, and black! Flowers, pumpkins, skulls...it looked awesome! 2. The tombstones were perfect! 3. Teresa is the cutest.